â€œEarth II â€“ You Have no Honorâ€ & "Earth II - Rebirth." Earth was attacked by a suspicious virus, and over 99% of the population was lost. Just as the world was stabilizing Alien spacecraft appeared in orbit. The remaining humans know who caused the virus. Julius sees an opportunity to gain resources and Joan, Tom Herl and SIMPOC must make a quick decision how to keep an eye on Julius and deal with the invasion. Joan, Tom, and SIMPOC follow Julius to the homeworld of the aliens that invaded Earth and find an enemy that invaded Earth for surprising reasons. The battle on Earth rages as the US Navy face an attacking alien force of sophisticated robots. Battles are fought in the Indian Ocean and Pearl Harbor. 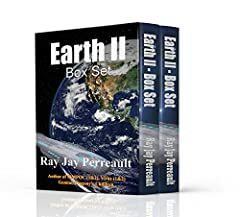 This is the 4th book in the Virus/Earth II series. Humanity has dealt with the alien invasion and found themselves traveling among the stars. They find other alien cultures, some they can trust and some they canâ€™t. More than 99% of the humans on Earth have died due to a suspicious virus from an alien invasion. A truce is finally worked out with the invading aliens, but now humans have thousands of spaceships as reparations for the mistaken invasion. The remnants of the US Government try to rebuild the world, but they encounter other aliens, some of whom may not be friendly. The rebuilding must be balanced with possible alien conflicts. Julius, the A.I. Android that was part of the original collapse of humanity, still, lurks on the horizon. His only objectives are to eliminate the threats to his existence; the remaining humans and the other AI computer SIMPOC.